Experience rustic elegance in this lovely log and timber lodging on 20 private acres in the Shenandoah Valley. 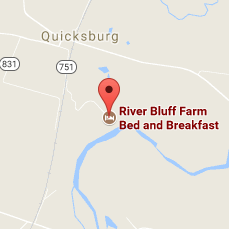 River Bluff Farm Bed and Breakfast is located above the banks of the North Fork of the Shenandoah River near New Market, VA. Enjoy breakfast in the cozy log cabin dining room or on the expansive deck overlooking the river. 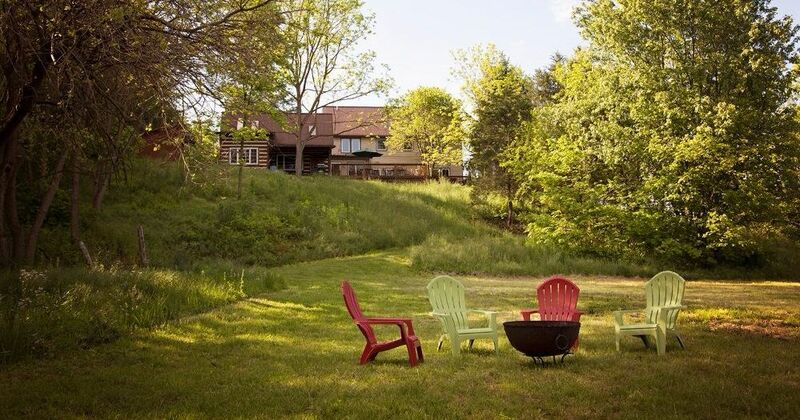 Sit on the back porch with your favorite beverage and listen to the waters of the North Fork slide along around the bend and down a small riffle. Hike to the top of the bluff for beautiful views of the Allegany and Massanutten mountain ranges. Put in or take out kayaks, canoes, and tubes on our river frontage. Whether floating or fishing, the North Fork is scenic and peaceful. 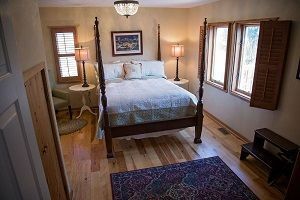 River Bluff Farm Bed and Breakfast offers three guest rooms, each with a private bath. Shared spaces available to all our guests include the main living room; the log cabin sitting area with fireplace; a dining area; a small, complete kitchen; a downstairs half-bath; and a cozy upstairs seating area. Outdoors, facing the riverside meadow and Shenandoah River, you’ll find a large deck with gas grill, tables, and chairs, and a covered porch. Wi-fi is available throughout the home and on the deck and back porch. Central heating and air conditioning keep you comfortable year round. Full home rental and extended stay lodging are available. Our breakfast menu varies from day to day. We’re happy to accommodate special scheduling requirements and dietary needs with advance notice. 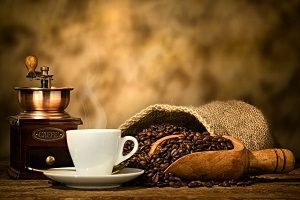 Breakfast is included with individual room reservations and is optional with full home rental and extended stay lodging. For lunch and dinner, you may choose to dine out or take advantage of the full kitchen and outdoor gas grill to create your own feast. The historic and beautiful Shenandoah Valley provides much to see and do. We’re conveniently located for access to I-81 and New Market, VA, New Market Battlefield, Shenandoah Caverns, wineries, breweries, Shenandoah National Park, and year round outdoor activities. We’re within thirty minutes of travel time to Luray, VA, Woodstock, VA, James Madison University (JMU) in Harrisonburg, VA and Orkney Springs, VA. Detailed information about check-in times, cancellation policy, and more can be found on our policies page. Please contact us if you have any questions or to talk about rates for an extended stay rental.